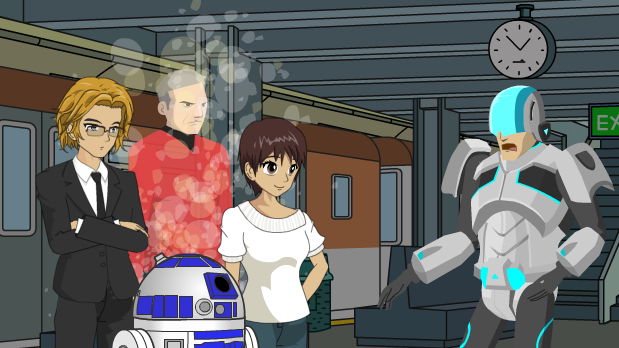 The Star Trek Fan is the second installment of an earlier animation I created back in March of 2013 called The Star Wars Fan. If you haven't seen it I would recommend you view it first as The Star Trek Fan is a kind of continuation of the dialogue but in a new subway location. Once again the Tourist, his travel companion Mia and their R2D2 unit are minding their own business when they are approached by a metro cop who inquires about their droid. With it being such a long time since the first installment I don't think I managed to get Mia's voice sounding the same or get any real difference between all of the character voices. Also the voices aren't consistent because I just wanted to get the animation finished, since it had been sitting in my GoAnimate account for months as I tinkered away on it between business animation clients. However I think it still works and the script is strong enough for people to overlook my poor voice work effort. The opening line where Mia says "What do you mean I sound like a man?" is a direct reference to the comments I got on the previous installment, despite my efforts to make Mia sound more female. The rest of the dialogue just grew organically from the premise of what if the same thing happened again but with a different metro cop? I knew at some point I'd have a red shirt guy de-materialize on the platform. Which may seem a little out of left field but (in my head at least) the Tourist is a dimensional traveler, modeled on Doctor Who. The implication suggested by the cop is that the Tourist, Mia and the R2 unit also arrived in the same fashion. For those of you that know the Star Trek in-joke about red shirts (mostly from the original series) you'll know that they tended to be the first - and only - crew members to die in any alien confrontation. Finally, if you know movies you may have recognized the Wilhelm Scream at the end. A very fitting sound effect for the demise of my Red Shirt guy when you consider that the use of the scream was revived and went on to be used in hundreds of movies after it was used in the original Star Wars film. Fun read---especially learning about the Wihelm Scream. I read the article but didn't re-watch the video, until of course I got to the end and read about the Wihelm Scream---than I watched so I could learn what you were talking about. I leaving here learning something new. Once you're familiar with the sound of a Wilhelm Scream you'll start hearing it a lot more - if you watch a lot of action movies of course. I'm never listening for it when I see a film but when I hear it my mind goes 'Wilhelm Scream' and then straight back into the movie, barely missing a beat. This is my Xtranormal take on red-shirts.